SOME FANS WERE SURPRISED WHEN The Roots accepted the gig as the house band for NBC's Late Night with Jimmy Fallon, but it's proved to be a perfect fit. 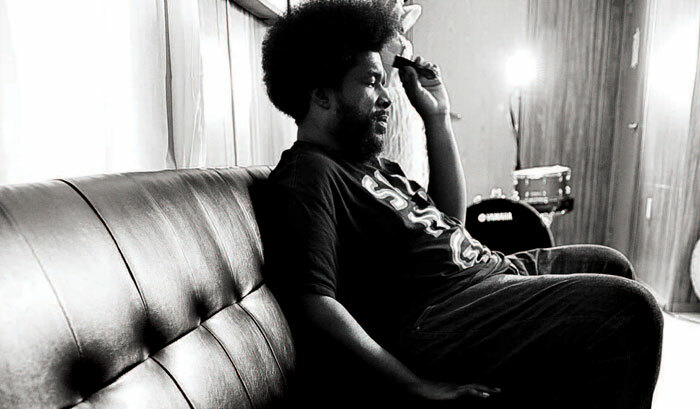 The Roots have long been hip-hop's leading exponents of real-time playing. Years of relentless touring and recording make them singularly qualified for the superhuman musical task of preparing new music for every episode, hundreds of night per year. 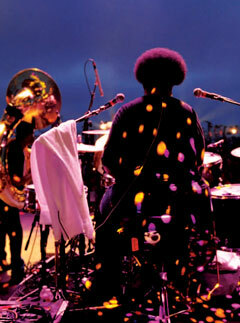 Drummer Ahmir Thompson, better known as ?uestlove or Questlove, is the show's music director. We spoke to him during a typically hectic production day as he scurried between rehearsals for sketches and music cues. WAS IT DIFFICULT MAKING THE LEAP FROM TOURING BAND TO HOUSE BAND? At first I was afraid to leave behind the comfortable world I knew with The Roots. I wondered how we'd adjust to playing one-minute music cues and Andrew Lloyd Weber medleys. We had to learn how to play sketches and do new kinds of music. On the other hand, Jimmy is a musician and a musical comedian, and there's more focus on the music than on other talk shows. To me it's more like a variety show than a late-night talk show. One reason modern music has lost its flair is because a lot of musicians put all their energy into songwriting and performance, but never think about how they actually sound. YOU'RE A SCHOLAR OF VINTAGE GROOVES AND DRUM SOUNDS. YOU EVEN PLAY A RETRO KIT ON THE SHOW. Yes. Apparently I have one of the first Yamaha drum sets ever made. I got it straight from their showroom, just like it was in 1967. I'm a stickler for vintage-sounding kits. I've always known Yamaha could make modern drums that rival those great old vintage kits, but I never knew that one day I might actually play one of those originals. I use several different Yamaha snare drums with it, though my favorite is probably my Dave Garibaldi Signature, because I get such a great snap out of it. WHAT'S THE APPEAL OF OLD-SCHOOL DRUMS? Well, I like a dead, vintage sound, not too refined. I always find myself requesting Yamaha's supposedly lower-tier instruments, as opposed to the top-of-the-line stuff, though I do have a new Phoenix kit arriving any day. But I usually use things like Beech Customs because they help me get an old, raggedy sound, as opposed to a polished one. YOU'VE BEEN PURSUING THAT SOUND ON RECORDINGS AS WELL. Absolutely. Actually, I consider myself more of an engineer than a musician or producer. One reason modern music has lost its flair is because a lot of musicians put all their energy into songwriting and performance, but never think about how they actually sound. But we were lucky to come up at a time when we could do a lot of experimentation. Partly that was because we were really paranoid about how the hip-hop nation would receive us. We knew we didn't want to sample, but we wanted to have the same gritty quality you get from samplebased hip-hop. I'd drum or an hour with one mic combo, then another, then another. We'd finally find something, and work from there. Most acts don't have the luxury of experimenting that way. BUT YOU'RE NOT COMPLETELY RETRO-YOU WERE AN EARLY PROPONENT OF YAMAHA'S SUBKICK. Yes, I was the guinea pig for the SubKick. They made it for me back during the D'Angelo tour in 2000. Before that, you needed triggers to get an 808-style kick sound. I still use the SubKick for hip-hop projects because you need that extra push. But on the latest things we've done, the drums are extremely vintage sounding. They're dirty, gritty, and raw-real gutbucket funk. Sometimes that means having the drums less up front than on our older recordings. The more I listen to '70s stuff, the more I realize that the drums just aren't that loud. I get closer than ever to that sound on the new Roots album, How I Got Over. Actually, I used my show kit for most of it. When we're not shooting, I just slide the kit over to our dressing room, much to the chagrin of our production manager. I tracked all the drums for the album right there. It's a studio first, and a dressing room second! YOU GET TO PLAY WITH SO MANY GREAT MUSICIANS ON THE SHOW. We've backed up Paul Simon. Public Enemy. Sheryl Crow. Taj Mahal. Mos Def. Many first-rate musicians sit in with us, even if they're not actual show guests. We've had Kurt Rosenwinkel, Chick Corea, Herbie Hancock, George Benson, David Murray. And just yesterday I had the pleasure of playing with one of my drumming idols: Tony Allen, Fela Kuti's drummer. SO WHAT'S BEEN YOUR MOST MEMORABLE MOMENT? Backing up Michael McDonald and Christopher Cross was a great highlight for me. Playing "Ride Like the Wind" and "Sailing" was amazing. We had to admit to ourselves that we are all secretly "yacht rock" geeks!